Shirley MacLaine as Fran Kubelik in The Apartment, released in June, 1960..
Shirley MacLaine is perhaps the most impish figure in cinema. Graced with a terrifically engaging personality as well as acting chops to match, MacLaine appeared in many films across the years, in roles almost always suited to her unique talents. Named after Shirley Temple, her father was an educator, while her mother was a drama teacher. Shirley and her younger brother Henry Warren (later to become Warren Beatty), grew up in several Virginia towns before settling in Arlington, where Shirley earned the nickname "The Powerhouse" for her atlectic skills in basketball and baseball. Mother Kathlyn chose to treat Shirley's weak ankles with dance lessons from age three; this is where her passion for performance springs from. Opting out of classical ballet, Shirley was a cheerleader, and appeared in drama class productions. Running away to New York at the age of barely-turned-19, resulted in her being selected from over 1,000 aplicants to join the dance chorus of Rogers and Hammerstein's Me and Juliet, running for 358 perfs in the 1953-54 season. MacLaine next got a gig in the chorus of The Pajama Game for 1,063, performances during the 1954 through 1956 seasons. She became an understudy to Carol Haney, who injured her ankle, allowing MacLaine to perform for a few months, beginning in May, 1954. Producer Hal B. Wallis caught her performances and offered her a contract to work for him at Paramount Pictures in Hollywood. Her first film was for no less a director than Alfred Hitchcock in The Trouble with Harry (released in October, 1955); she got thrid billing. Next, she appeared in the Dean Martin / Jerry Lewis picture Artists and Models (released in November, 1955). Producer Mike Todd cast her as David Niven's exotic travel companion in Around the World in 80 Days (released in October, 1956). MacLaine stole hearts by playing a not-too-bright floosy in love with Frank Sinatra in Some Came Running (released in December, 1958), then starred with Sinatra again in the Cole Porter musical Can-Can (released in March, 1960). But MacLaine really shone as Fran Kubelik in director Billy Wilder's classic, The Apartment (which played the Chinese in June, 1960) with Jack Lemmon. Wilder wanted to work with them both again, but MacLaine would appear in The Children's Hour (released in December, 1961) for director William Wyler, My Geisha (released in January, 1962), and Two for the Seasaw (released in November, 1962) for director Robert Wise. Reuniting with both Jack Lemmon and director Wilder, Irma La Douce (which played the Chinese in July, 1963) would become the most finanically successful comedies of the 1960s. Just before the picture opened, MacLaine and Lemmon were invited to a double Forecourt ceremony. In What a Way to Go! (released in May, 1964), MacLaine got top billing over the likes of Paul Newman and Robert Mitchum. A variant on this was director Vittorio De Sica's Woman Times Seven (released in June, 1967). MacLaine was cookin' so much that she was cast in the title role of the Bob Fosse musical (well, based on a Fellini film), Sweet Charity (released in February, 1969). In the seventies, MacLaine sought out different directions for her work. She starred with Clint Eastwood in a western romance Two Mules for Sister Sara (released in May, 1970), then had a television show called Shirley's World for 17 episodes over ABC during the 1971-72 season. 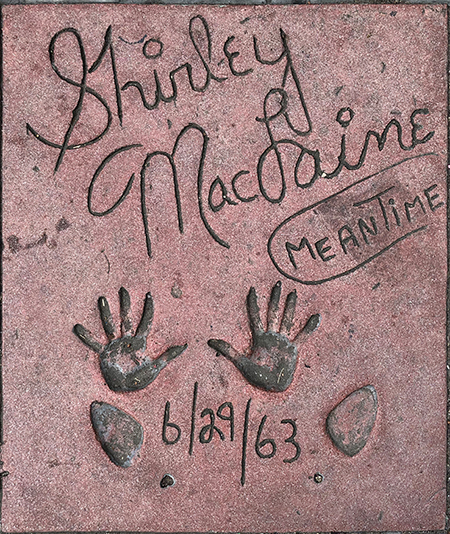 Taking a break from films, MacLaine developed a musical revue, Shirley MacLaine which played the Palace Theatre on Broadway during the 1976 season, and took the show to London's Palladium as well. MacLaine returned to cinemas in a film about ballet. The Turning Point (released in November, 1977), was a hit, bringing her solidly into the 1970s star universe. Her supporting role in Being There (released in December, 1979), is a sheer delight, which was followed by her Oscar-winning turn as a evolving mother to Deborah Winger in Terms of Endearment (which played the Chinese in December, 1983). 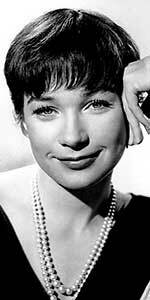 MacLaine relaunched her musical revue Shirley MacLaine on Broadway during the 1984 season, then starred as herself in a television movie detailing her adventures in spiritualism, Out on a Limb aired on ABC in January, 1987. Returning to music, she played an eccentric piano teacher in Madame Sousatzka (released in October, 1988), and joined the ensemble cast of Steel Magnolias (released in November, 1989). In what some consider her bravest role, MacLaine played a faux Debbie Reynolds to Meryl Streep's faux Carrie Fisher in Postcards from the Edge (released in September, 1990). She then played a former first lady in Guarding Tess (released in March, 1994), and starred in the Terms of Endearment sequel, The Evening Star (released in December, 1996). In a rare period peice, MacLaine had a supporting role in the television mini series Joan of Arc aired over CBS in May, 1999, then played the title role in the television movie The Battle of May Kay, aired over CBS in October, 2002. She played Endora to Nicole Kidman's Samantha in Bewitched (released in June, 2005), starred in director Rob Reiner's Rumor Has It . . . (which played the Chinese in December, 2005), and played Elizabeth McGovern's American mother, Martha Levinson, on the television show Downton Abbey, originally aired over ITV in Britain and PBS in America, beginning in 2012. MacLaine is still rather busy. She co-starred with Christopher Plummer in the romance Elsa & Fred (released in November, 2014), has done a a couple of guest shots on Glee, aired over Fox Network in April and May, 2014, and appearessd with Amanda Seyfried in The Last Word (released in March, 2017), filmed when MacLaine was 82. Not bad at all! Grauman's Chinese Theatre, Hollywood, California. 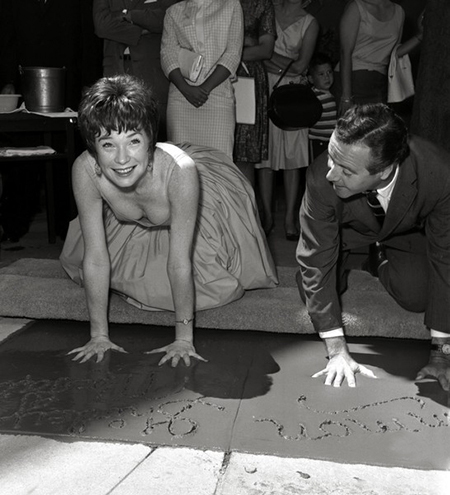 Jack Lemmon / Shirley MacLaine Forecourt ceremony, Saturday, June 29, 1963. Shirley MacLaine and Jack Lemmon place their hands in separate blocks to celebrate their newest film, Irma La Douce, which would play the Chinese the following week (for 16 weeks! ).